Walk bearing heavy loads on your traps and strengthen the stabilising muscles of your spine and core. 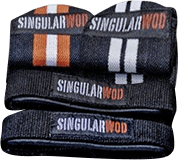 The Singular WOD Yoke epitomises the Strongman ideal. Walk bearing heavy loads on your traps and strengthen the stabiliser muscles of your spine and core. Made from structural steel with a stove-lacquered powder paint coating finish, our yoke has four different options to load your plates. Its 1.96 metres are more than sufficient to adapt it to your height. For this it has a 4 quick release pin fastening system, so the height of the support bridge can be adjusted in only a few seconds. Its weight when not loaded is 68 kg. If you combine our yoke with a pair of 50-mm J-Cups you can use it as a mobile rack for strength exercises such as squats or bench presses. Compatible with: Triceps dip station for racks, 50-mm j-cups, plate storage post for racks. Train your whole body with our sled, allows for intense and dynamic push and pull exercises on any type of surface.